The foreign secretary should "hold the BBC's feet to the fire" to protect the World Service, MPs have said. A report by the foreign affairs committee was published as the BBC prepared to take over responsibility for funding the service. It welcomed a BBC pledge to maintain the annual £245m budget, but called for stronger World Service representation at the highest level of BBC management. 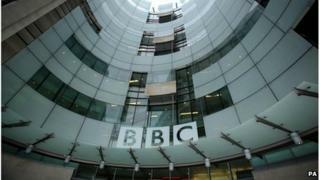 The BBC vowed to be a "better steward" of the service than the government. In October 2010, it was announced that the BBC would take over the cost of the World Service from the Foreign Office from April 2014. No provision was made to increase the licence fee to allow for the new expenditure. In its report published on Monday - entitled Future of the BBC World Service - the committee expressed concern about the transfer of funding. "We have always held reservations about the move to licence fee funding for the World Service and what that would mean for the World Service's budget, and its ability to be heard amongst all the other competing voices within the BBC," said Sir Richard Ottaway, the committee's chairman. In June 2013, the BBC Trust announced that the World Service budget for 2014-15 would be £245m, up from £238.5m the previous year. Speaking last week, in front of the foreign affairs committee, the BBC's director of news and current affairs, James Harding, said that budget would be maintained "as a baseline" until 2017, when the BBC's Royal Charter once again faces renewal. Image caption The BBC's director of news said the corporation had a "deep commitment" to the World Service. Mr Harding said he was "going to commit to that current budget and will protect the World Service", although he was unable to give a specific breakdown of figures as "all parts of the BBC work on a year-by-year basis". The committee welcomed Mr Harding's assurance, but noted that "strains within the BBC are already evident" as the corporation attempts to achieve £700m in savings over four years. It cited director of television Danny Cohen's recent suggestion on BBC Radio 5 Live that the requirement to fund the World Service from the licence fee had contributed to the decision to move BBC Three online. Mr Harding told the committee last week it was "important to be clear that we are to be committed to the World Service". "The BBC has to find £700m worth of savings and we need to find our priorities, but we have a very, very deep commitment to the World Service," he insisted. The report welcomed his comments, but said "what is really needed is longer-term protection at institutional level". It stressed the need for proper representation of the World Service at management level, expressing concern that the service no longer has "a direct voice". Peter Horrocks, the director of BBC Global News, sits on neither the BBC's executive board nor the management board. Last week Mr Harding argued that the World Service did have a voice at the "top table" - his own. The report said: "He [Mr Harding] strongly favoured integration of the World Service within the BBC, saying that the 'worst outcome' for the World Service would be for it to be considered as an 'adjunct to the BBC' or a 'ghetto'." In the report, the foreign affairs committee concluded it had "clear differences" with the BBC over the governance of the World Service - and had sought the assurance of the foreign secretary, who had said he would "always hold the BBC's feet to the fire" in protecting the interests of the World Service. "It remains to be seen whether they will indeed safeguard the distinct nature of the World Service," the report states. A BBC spokeswoman said: "We believe the BBC will prove a better steward of the World Service than the British government, offering stable and predictable funding rather than the politically driven cuts of the last few years. "The World Service's future is safe in our hands." The World Service, which started broadcasting in 1932, has an audience of more than 190 million worldwide across radio, television and online.